Christian Green, Carter Mackle and Will May contributed to this article. Thundercat was the first headliner we experienced at Hopscotch Music Festival. I was already a fan going into the concert, so my expectations were sky-high. And I was not disappointed. Thundercat entered the City Plaza stage with his band trailing behind him and a large white hat pulled down over his blonde cornrows to the lowest point on his forehead. News of the death of his dear friend and collaborator, rapper Mac Miller, had broken a few hours previously, and it showed. “This show is for Mac,” he said when the crowd quieted down. He then looked to his bandmates and launched into their set. In brief, the set was incredible. Thundercat’s fingers flew up and down the neck of his impressive six-string bass guitar. The surgical precision and speed of his fingers was mesmerizing, matched only by the skills of the other members of the band. To put it mildly, the funk was relentless. He played many of his most popular songs off his 2017 album Drunk, including his hit single “Them Changes” and my personal favorite “A Fan’s Mail,” a song that poignantly expresses the singer’s love for their cat.“If any of y’all know this s***, sing along,” he said before passionately meowing into the microphone. Thundercat’s Hopscotch set was an overall enriching and touching experience. It was a very bittersweet feeling to witness someone take a kind of catharsis from their music, especially when said music is so impressively performed and so infectiously danceable. R&B artist Miguel headlined Friday night at Raleigh’s Red Hat Amphitheater. Coming off of his late 2017 album War & Leisure, Miguel has slightly shifted his public image from that of a purely sexual icon to a more lyrically matured and socially aware artist. Instead of overt politicism, Miguel has instead emphasized a focus on positivity in the face of an overwhelmingly negative news cycle and highlights what it means to recognize the issues of the world while still attacking them from an optimistic outlook. This aspect became especially poignant during Friday’s performance in light of rapper Mac Miller’s death, which was announced only hours before Miguel took the stage. Rather than a long speech touching on the subject, Miguel instead said that the best way to honor Miller would be to enjoy his music. And with that the intro to Miller’s song “Weekend,” which features Miguel, began playing. “I don’t even want to sing this one right now. We should all just dance and vibe to this one in honor of a great man,” Miguel said. After this moment, the concert in general seemed to shift into a much stronger form. Where earlier Miguel’s visuals and lights had been more subdued, the second half of the show opened up into a grand showcase of psychedelic visuals mixed with Miguel’s dancing and crooning vocals. Perhaps the most impressive aspect of the whole show was Miguel’s vocal performance, which was so clean it could have been mistaken for the record audio. Even some notes that sound like they would have been taxing to nail in a recording studio were hit effortlessly as he swayed, jumped and moonwalked around the stage. Critics and avid fans will still debate if this new image is fitting for Miguel, of if his album is even actually political, or just a few references and callouts guised as commentary, but at the end of the show, Miguel made certain that he really only wants one thing. Just hours after losing a friend, Miguel called for his listeners to remain positive even on their darkest days. On Saturday night, we had the pleasure of seeing Moses Sumney headline at Red Hat Amphitheatre. The crowd was small enough that we made the front row without too much trouble; I was front and center, holding onto the handrail. The sun was just beginning to set as Moses and his band took the stage. He was dressed in all black, including a pair of round tinted sunglasses that completely obscured his eyes. He took his place behind a bizarrely angular podium that had several microphones attached to it. Then the music began. Moses’ trademark dark and ambient R&B was as gorgeous as ever. The contraption that he stood at was revealed to both act as a looper and a vocoder, letting the artist skillfully manipulate his velvety vocals in time with the band’s accompaniment. The sunset acted as the perfect backdrop to the music, resulting in a beautiful visual and auditory harmony, the kind you only see in movies. About halfway through the set, Moses slowly approached the audience, belting out notes. My heart was racing as he came within five feet of me. Then four. Then three. He extended his hand. Fortunately for my cardiovascular health, the girl standing at the rail next to me took it. They held hands as his voice crescendoed to the song’s climax. I still couldn’t see his eyes, but I could tell they were staring into hers. It was completely dark by the time his set ended. The music was very unconventional, but the man’s artistry had adhesive properties, powerfully holding the act together and making it an experience to remember for a lifetime. 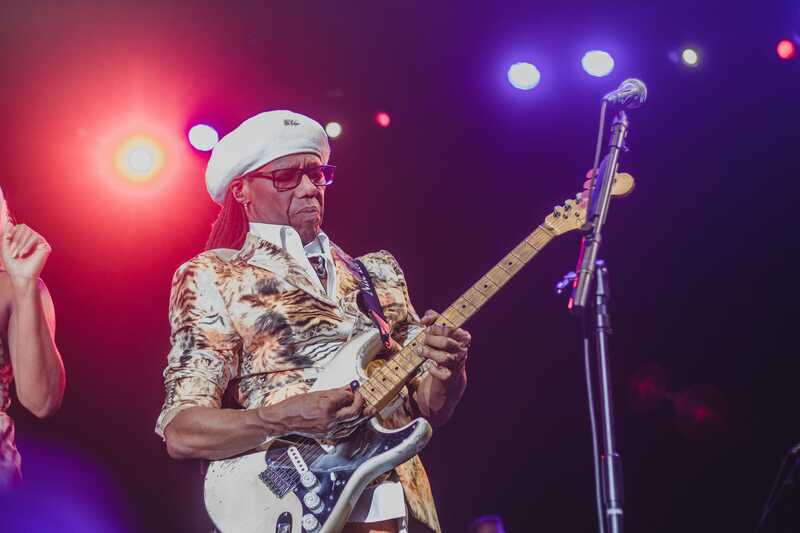 Closing the mainstage Red Hat Amphitheater, Nile Rodgers & Chic threw one of the most entertaining and joy-filling evenings one could have. With each individual member getting their own solo, from the bass guitar to the saxophone, it felt very much like a jam-session between extremely prolific artists. With hits like the Sledge Sisters’ “We are Family” and Duran Duran’s “Notorious,” to their own “I Want Your Love,” the crowd was never short of fans singing along, dancing along, or in most cases (including my own) both. I even began to be surprised by how many songs Rodgers was a collaborator for, like when they began Madonna’s “Like A Virgin.” I really began to understand how diverse Rodger’s musical pedigree is and continues to be. Throughout the show, Rodgers and other members of the band took the spotlight, speaking candidly to the crowd. The show was a spectacle, with Rogers bringing his collection of hits to a peak, breaking into a more dance-funk themed rendition of Daft Punk’s hit “Get Lucky,” himself stating how lucky he felt to share such an evening with everyone. Ending on a high note, they closed the show with their classic hit “Freak Out,” and it seemed as if the entire crowd kicked it into high gear. There has never been a more succinct, fantastic closing act to a festival, as the already tired crowd quite literally ‘freaked out.’ This energy didn’t cease until the final lights came on, and even then we longed for more.